Maybe you saw last year's Oscars, and witnessed Ellen and a confused pizza delivery man give Chiwetel Ejiofor a pie. Maybe you felt jealous of Chiwetel because he got to eat pizza and watch the Oscars at the same time, all while wearing a tuxedo and being an Academy Award-nominated actor. 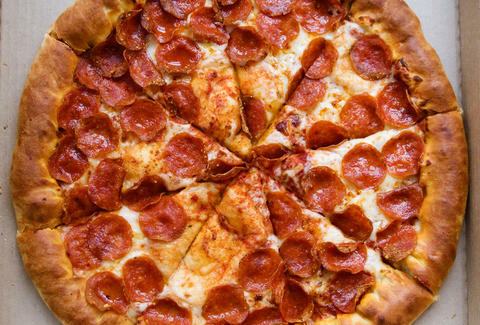 Well, now's your chance to live out at least a few aspects of that scenario, because Pizza Hut is offering a handful of lucky viewers/pizza-eaters a chance to win FREE PIZZA FOR AN ENTIRE YEAR. And all you've gotta do is dress up. Pizza Hut's "All Dressed Up With Pizza to Go" promotion is happening this Sunday, and all you need to do to be entered to win free pies for an entire year (enough to last you until the next Oscars!) is wear some fancy clothes, follow Pizza Hut on Twitter, and tweet them a picture of yourself watching the Oscars with the hashtag #AllDressedUpWithPizzaToGo. They're also encouraging folks to eat pizza in the photos, which is great, because it gives you an excuse to eat pizza (not that you need one). And in case you don't want to get all gussied up, you can participate a little more casually and get free Flavor Sticks with your Pizza Hut pie by using the promo code REDCARPET. It's what Chiwetel Ejiofor would want for you. Adam Lapetina is a Food/Drink staff writer for Thrillist, and hopes he doesn't get any tomato sauce on his bow tie. Read his musings at @adamlapetina.